Yesterday was the first birthday of One Particular Kitchen! Yay! So I did what anyone would do: I made a cake. My mother made this cake for my birthday a few times and it was always spectacular and pink and fluffy. I was am the kind of little girl who thinks there can never be too much pink, and this cake was just the prettiest, most precious thing my birthday-girl self could dream up while I was running around in Gunne Sax dresses (which were, of course, pink). Did I mention I make this in my pink Kitchenaid mixer? I have a copy of this recipe, officially called Strawberry Layer Dessert, that came out of my mother’s cookbook, and I’m afraid I’m not sure which one it was; likely early versions of the Better Homes and Gardens or Betty Crocker picture books, but it’s nowhere to be seen in either one of those books I have on my shelf. This one involves some downtime between steps, so be sure to allow yourself time to get everything done. I ended up with frozen whole strawberries that did not have syrup, so I put them in a bowl with some sugar while they thawed, which produced some lovely syrup. Instead of slicing I just broke them up a little with a fork before folding into the whipped cream mixture and they were lovely! This is so fabulous! 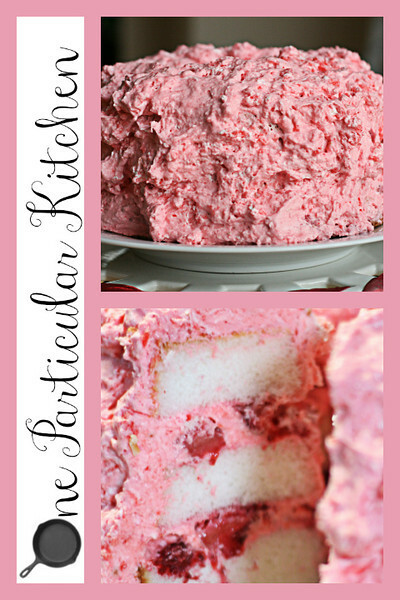 It seriously is Barbies dream cake….and mine! YUM! And it’s definitely PINK! What a great looking cake! Makes me wish for summer now that it’s so cold here! Gorgeous! Love the pink, love the strawberries, and LOVE how light and airy this looks – it is just begging for Springtime to come and help everyone forget the Winter for a little bit! Happy Birthday to your blog! Wow! What a beautiful, stunning cake fit for a princess! Must taste ultra refreshing, too! I saw your picture on Photograzing and had to stop by. It is so gorgeous! And I bet it tastes every bit as good as it looks. I just love it! This looks amazing! It looks so light & fresh, yum! Happy blogiversary! And you are right – this is a Barbie Dream Cake if I have ever seen one! I have been making this cake for many, many years. We all love it. it is so light and fluffy, the perfect ending to a nice dinner. I often make it for my husbands birthday because he loves it so much.